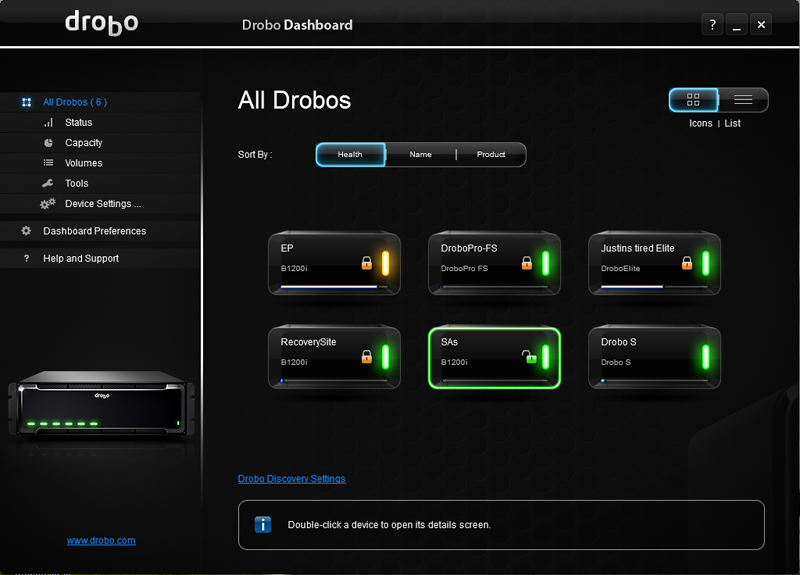 The primary user interface is on the front of every Drobo. A status light for every drive bay and a capacity gauge to see how much data is currently stored. After the Drobo is set up, no other management tool is needed. 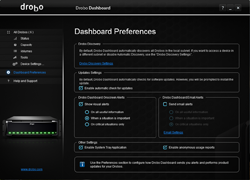 Drobo Dashboard is the new management application that enables you to get status on and configure all your Drobos in one window. Wouldn't it be nice to see all your Drobos from a single window? 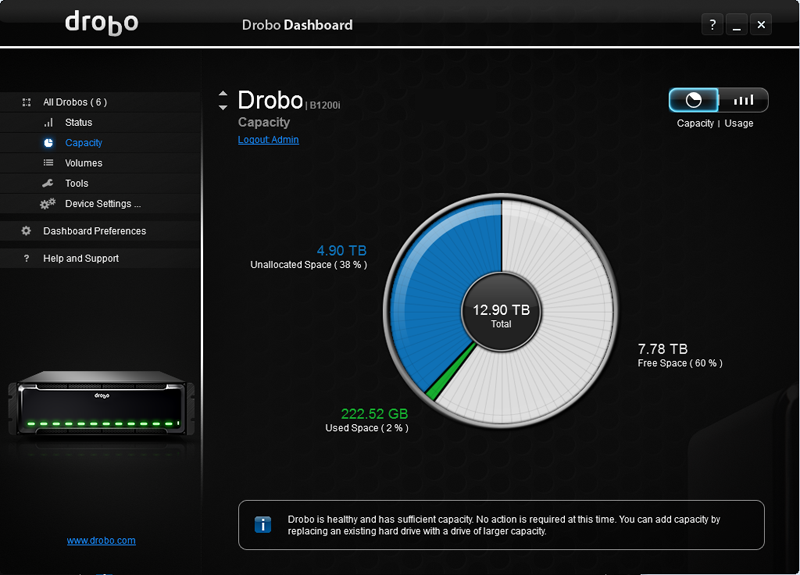 That's what Drobo Dashboard does. Drobo Dashboard, running on Windows or Mac OS X, is the management application for both Drobo Prosumer and Business products that enables you to get status on and configure all your Drobos in one window. 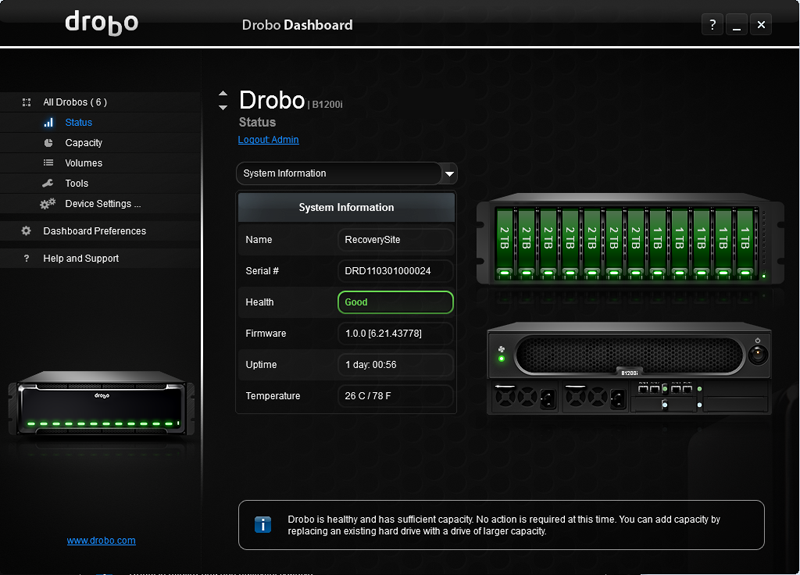 Drobo Dashboard automatically discovers the Drobos on your network so that you can click through for capacity, status, and other information. If you're running the most recent version, you'll see that DroboCopy tasks now run in the background and you can configure email alerts to more easily monitor your Drobos. 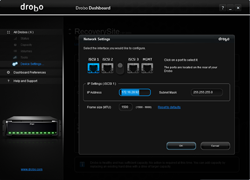 When Drobo Dashboard is launched, it shows all Drobos connected to your computer and scans the network for file sharing and iSCSI Drobos. 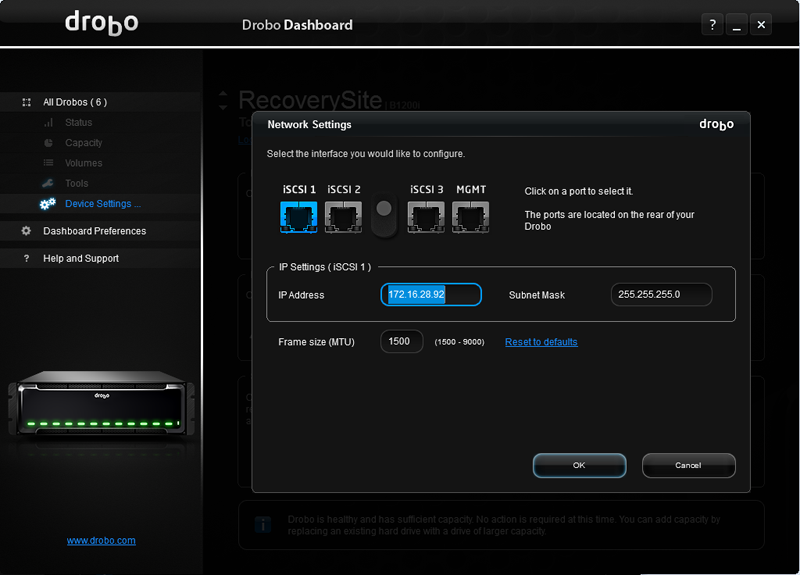 The front panel of a Drobo is the primary user interface and Drobo Dashboard lets you see in the front panel all your Drobos from a remote location. Display a detailed, but easy-to-read, capacity chart with a pull-down menu to access common Drobo tools for naming the device, updating firmware, and shutting down. With one click, see exactly how raw disk capacity is being used and how much space is available. All of the settings windows are simple and easy to use — as expected with Drobo. General, network, and administrator settings are each displayed in separate screens. 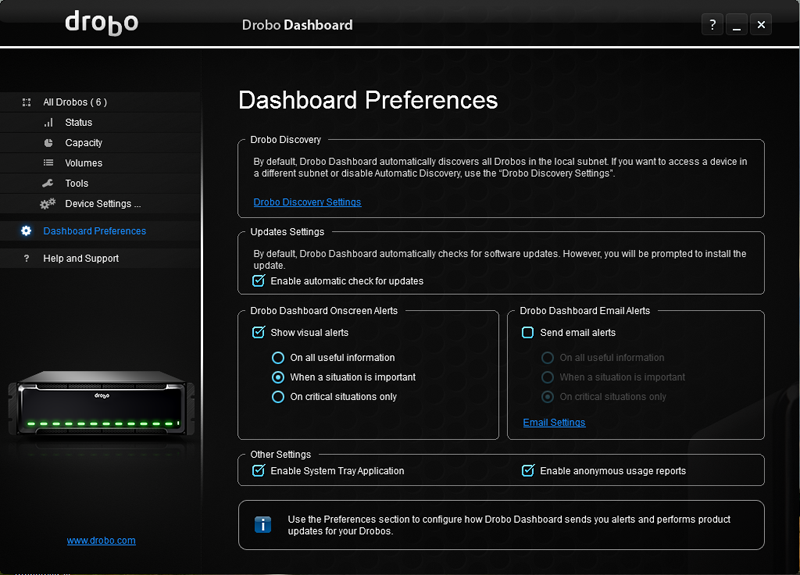 Management options such as email notification are easily configured in Drobo Dashboard. IT administrators have the tools to monitor Drobos without any day-to-day effort. You can get detailed status about the Drobo and its drives. Since Drobo supports mixed drive types and sizes, it helps to know in which bay a drive is located. When Drobo is running low on space, simply remove the smallest drive and replace it with a larger one. Directions and helpful tips are included on each screen so they are available to you in the right place at the time you need them. 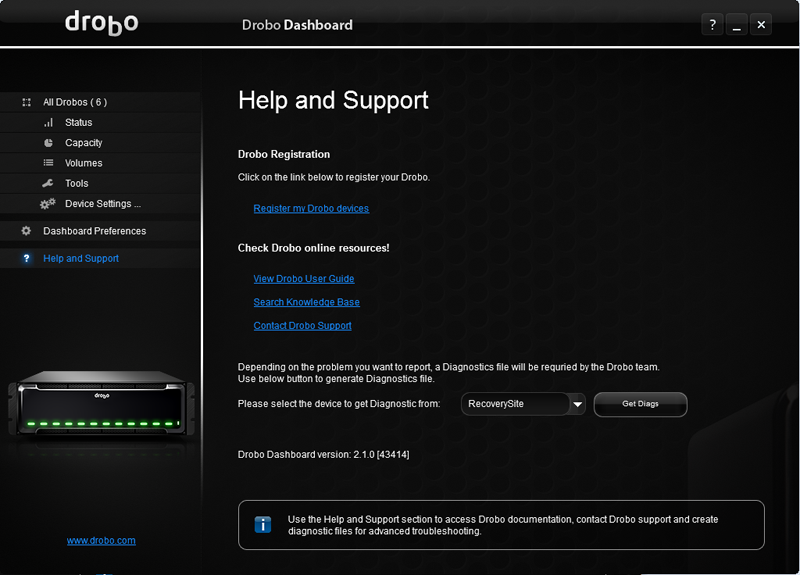 You can also access documentation, information, and even register your Drobo from inside Drobo Dashboard. And if you need it, create a Diagnostics file to help resolve issues with the Drobo Support team. 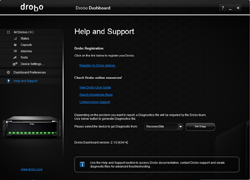 Visit Software Updates to download the latest version of Drobo Dashboard and view the release notes.